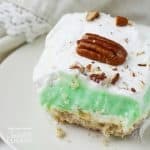 This Pistachio Lush is the perfect easy dessert for entertaining, especially when you want something decadent but not too heavy. Combine the flour, butter and 1/2 cup pecans in a food processor and blitz until a ball of dough forms. Line a 9x9 baking dish with parchment paper and press the crust overtop into a flat layer. Bake 8-10 minutes until just lightly golden. Cool completely before adding on the lush layers. Combine the cream cheese, powdered sugar and 1 cup of whipped topping until smooth. Spread the cream cheese layer over the crust and place in the fridge as you prepare the pistachio filling. Combine the pistachio pudding mix and milk, and mix for 2 minutes until nice and thick. Pour over the cream cheese layer and spread evenly with an offset spatula. Top with the remaining whipped topping and garnish as desired. This recipe for Pistachio Lush was printed from AmandasCookin.com - https://amandascookin.com/pistachio-lush/ and can only be printed for education or personal use.